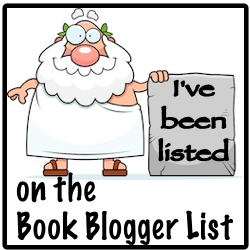 Comic Towel: Manga Mysteries ~ Sherlock Holmes Had a Niece? Okay, for all the manga readers time to share a series I discovered a little over a year ago. I almost looked over this one, and then realized my Comic Towel drawings were inspired by this style of art. 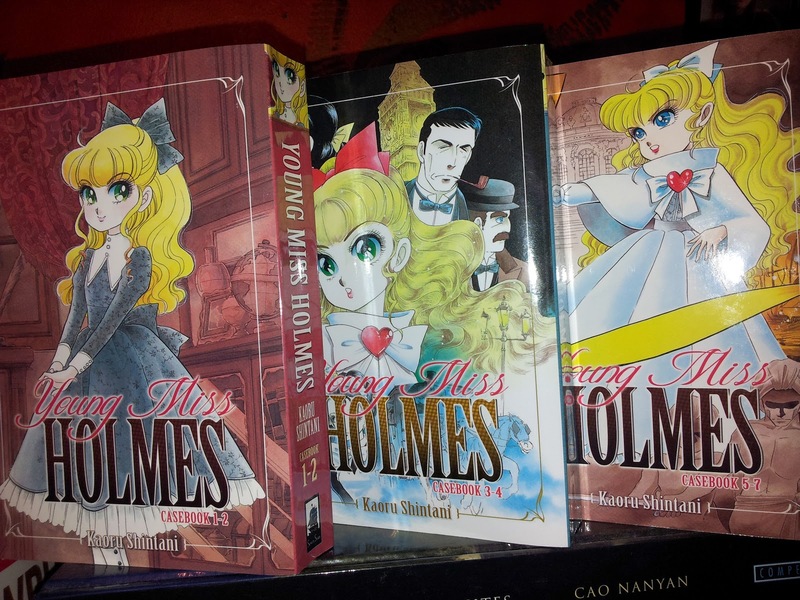 Blend that with my month of reading mysteries, and consider me encouraged to share Kaoru Shintani’s Young Miss Holmes (Seven Seas Entertainment), or its Japanese title, Christie High Tension (Media Factory). Debutting in 2007 (it didn't hit the west till 2012), Young Miss Holmes tales about an aristocratic and--somewhat presumptuously educated--ten-year-old named Crystal "Christie" Margaret Hope. She goes by "Christie" as a polite throw to English crime novelist, Agatha Christie; and it just so happens she's the niece of famed literary figure, Sherlock Holmes. 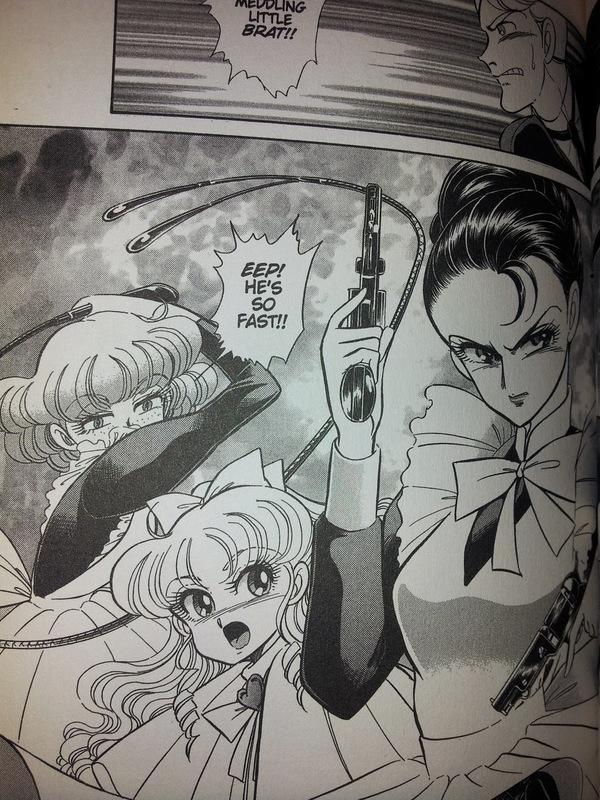 The homages to manga-Christie's character blooms rampant and clear. Nonetheless, as a character who has her own, her University-level education translates through her unique ability to discern her surroundings with blade-like sharpness. This ability supports her subsequent need to ask questions, leading to a performance of logical deductions and reasoning. Have I pumped up Christie too much? Probably so. But I like her so I must continue. On the other hand, her aristocratic upbringing translates into her freedom to roughly--but resourcefully--explore her talents with a decorum of respect from others. Besides her exercised clout of owning the title as the niece of Sherlock Holmes, this exploration includes Christie’s need to run behind her uncle and his murder cases. However, she often falls down the tunnels of her own hunches until she’s left to dig her own way out. Which strengths my resolve for loving the mystery genre because it's always about characters thinking for themselves. Mutton sleeves attached, Christie is either cornering a jewel thief; deciphering a murderous lithograph; or pursuing Shintani’s twist on Holmes's popular case, The Hound of Baskerville. And while Christie does much of her sleuthing to gain the approval of her famed uncle, she is not alone in her pursuits as she drags her unexpectedly self-sufficient teacher and nannies into her troubles. Each and all done with some amazing manga-style flips, flares and wit. Oh, and some hard India ink. 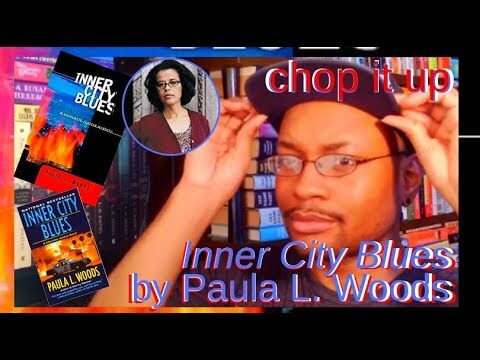 I am currently working my way through each story-packed volume with a balanced pace. See, I confess that I sometimes read quickly through manga and graphic novels, to the point of walking away with nothing of use besides admiring the art. Maybe because this is a mystery manga that I’ve decided to take my time, much like how I did with Tadashi Agi‘s thriller series, Remote, some years ago. 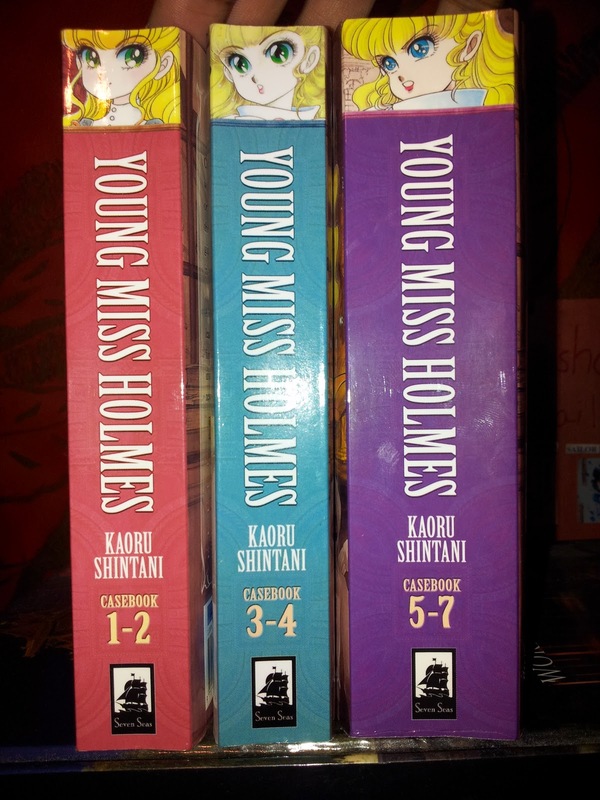 Nonetheless, from Young Miss Holmes, I find myself charmed with Shintani’s whodunit storytelling underneath his obvious, sparklingly admiration of Author Doyle's virtuoso. Shintani does dip a touch into fantasy, but his stories are not without that cobblestoned London 1891 glow that's probably rarely seen in manga. The amusing, over-expressed (classic in my eyes) construction of his line work carried each story just as cleanly as the stories themselves. His style has the throwback appeal of manga from the 1980s, ala Project A-ko and Galaxy Express 999; and that, along with early 90’s style, appeals to me from a growing-up stance. I should mention that I do adore Christie. Or did you already figure that out? Yes, she can sometimes be a brat. Despite all of her intelligence, she’s still ten. However, there is a compassionate side to Christie that is easy to miss. One example lie in her encouraging words to her troubled, illiterate nanny. Like I said, something unanticipated remains here beyond the mystery and comedic attitude of the series. Nevertheless, I love how outstandingly fun and hilarious this series is, as well as bewildering. Bewildering in a good way I should say. Whatever the case, Scandal’s “The Warrior” would easily describe Christie’s detective moxie. After I finish Rita Mae Brown’s Wish You Were Here, I feel another episode of Christie coming along.